San Diego /ˌsæn diːˈeɪɡoʊ/ is a major city in California, on the coast of the Pacific Ocean in Southern California, approximately 120 miles (190 km) south of Los Angeles and immediately adjacent to the border with Mexico. San Diego is the eighth-largest city in the United States and second-largest in California and is one of the fastest growing cities in the nation. 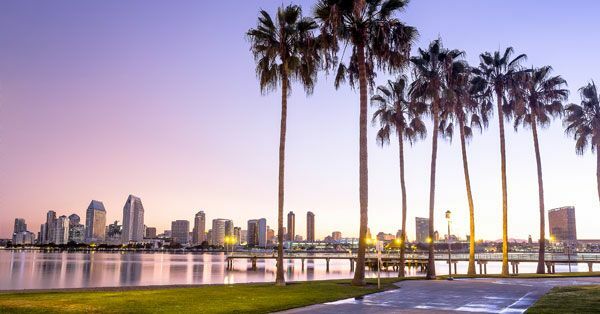 San Diego is the birthplace of California and is known for its mild year-round climate, natural deep-water harbor, extensive beaches, long association with the U.S. Navy, and recent emergence as a healthcare and biotechnology development center. The population was estimated to be 1,322,553 as of 2012. Downtown San Diego is located on San Diego Bay. Balboa Park encompasses several mesas and canyons to the northeast, surrounded by older, dense urban communities including Hillcrest and North Park. To the east and southeast lie City Heights, the College Area, and Southeast San Diego. To the north lies Mission Valley and Interstate 8. The communities north of the valley and freeway, and south of Marine Corps Air Station Miramar, include Clairemont, Kearny Mesa, Tierrasanta, and Navajo. Stretching north from Miramar are the northern suburbs of Mira Mesa, Scripps Ranch, Rancho Peñasquitos, and Rancho Bernardo. The far northeast portion of the city encompasses Lake Hodges and the San Pasqual Valley, which holds an agricultural preserve. Carmel Valley and Del Mar Heights occupy the northwest corner of the city. To their south are Torrey Pines State Reserve and the business center of the Golden Triangle. Further south are the beach and coastal communities of La Jolla, Pacific Beach, and Ocean Beach. Point Loma occupies the peninsula across San Diego Bay from downtown. The communities of South San Diego, such as San Ysidro and Otay Mesa, are located next to the Mexico – United States border, and are physically separated from the rest of the city by the cities of National City and Chula Vista. A narrow strip of land at the bottom of San Diego Bay connects these southern neighborhoods with the rest of the city. For the most part, San Diego neighborhood boundaries tend to be understood by its residents based on geographical boundaries like canyons and street patterns. The city recognized the importance of its neighborhoods when it organized its 2008 General Plan around the concept of a “City of Villages”. 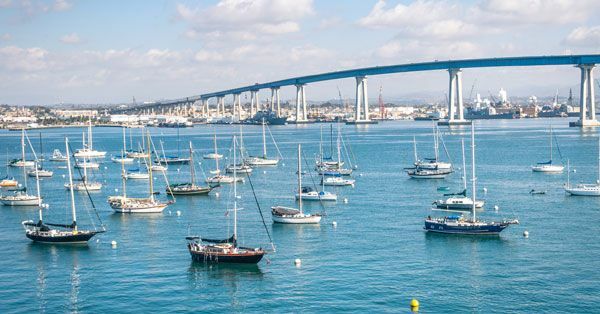 San Diego is one of the top-ten best climates in the Farmer’s Almanac and is one of the two best summer climates in America as scored by The Weather Channel. Under the Köppen-Geiger climate classification system, the San Diego area has been variously categorized as having either a semi-arid climate or a Mediterranean climate. San Diego’s climate is characterized by warm, dry summers and mild winters with most of the annual precipitation falling between December and March. The city has a mild climate year-round, with an average of 201 days above 70 °F (21 °C) and low rainfall (9–13 inches [23–33 cm] annually). Public schools in San Diego are operated by independent school districts. The majority of the public schools in the city are served by the San Diego Unified School District, the second-largest school district in California, which includes 11 K-8 schools, 107 elementary schools, 24 middle schools, 13 atypical and alternative schools, 28 high schools, and 45 charter schools. According to education rankings released by the U.S. Census Bureau, 40.4 percent of San Diegans ages 25 and older hold bachelor’s degrees. The census ranks the city as the ninth-most educated city in the United States based on these figures. Public colleges and universities in the city include San Diego State University (SDSU), University of California, San Diego (UCSD), and the San Diego Community College District, which includes San Diego City College, San Diego Mesa College, and San Diego Miramar College. Private colleges and universities in the city include University of San Diego (USD), Point Loma Nazarene University (PLNU), Alliant International University (AIU), National University, California International Business University (CIBU), San Diego Christian College, John Paul the Great Catholic University, California College San Diego, Coleman University, University of Redlands School of Business, Design Institute of San Diego (DISD), Fashion Institute of Design & Merchandising’s San Diego campus, NewSchool of Architecture and Design, Pacific Oaks College San Diego Campus, Chapman University’s San Diego Campus, The Art Institute of California-San Diego, Southern States University (SSU), UEI College, and Woodbury University School of Architecture’s satellite campus. There is one medical school in the city, the UCSD School of Medicine. 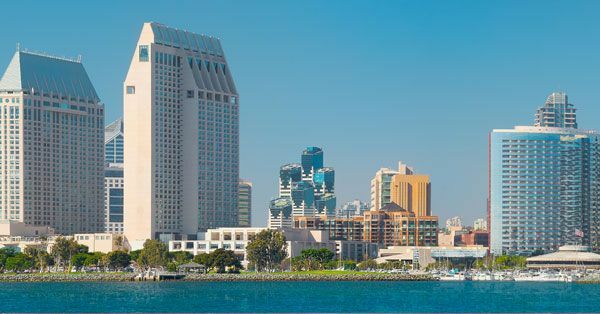 There are three ABA accredited law schools in the city, which include California Western School of Law, Thomas Jefferson School of Law, and University of San Diego School of Law. 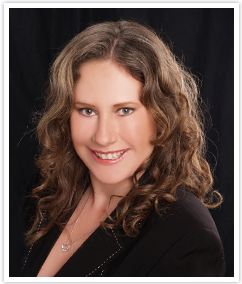 There is also one unaccredited law school, Western Sierra Law School.